Update: This parks and nature group has adopted the name Pathways to Parks. 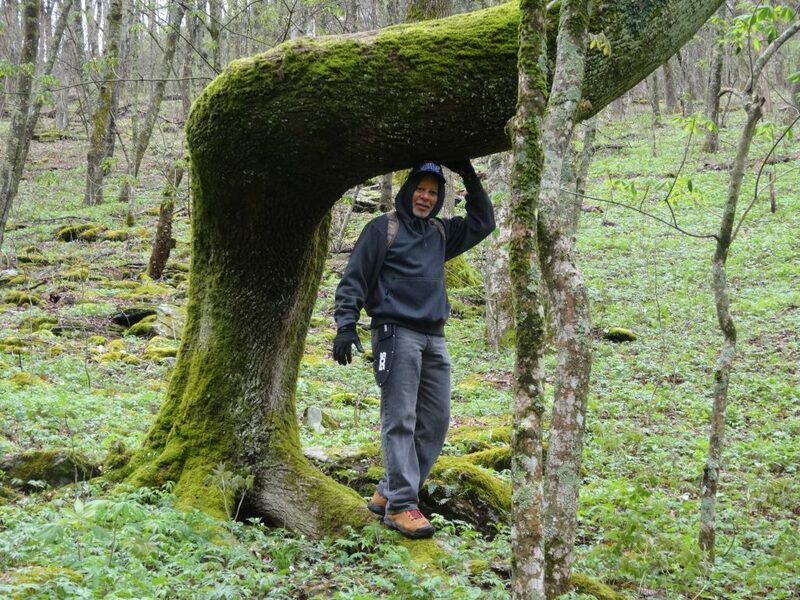 The goal of the group is to encourage black and brown people to take advantage of parks, trails, and nature preserves through activities such as hiking, camping, cycling, tennis, walking, and picnicking. If you are interested, please contact Tanya Shahid-Cummings at pathwaystoparks@yahoo.com. “Are they crazy?” Tanya Shahid-Cummings wanted to know. She was on a mountain, looking at a narrow trail at the edge of a sheer drop. But her companions were cheerfully walking it. She could turn back. She had before, when she found herself in situations outdoors that intimidated her. But this time, she says, “I didn’t want to be the chicken in the group.” And she didn’t want to let them down. 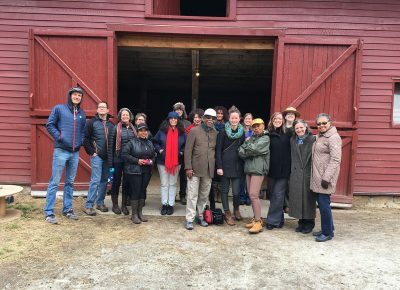 They were trying out a new idea—a group that would get people of color together to explore local parks and trails. 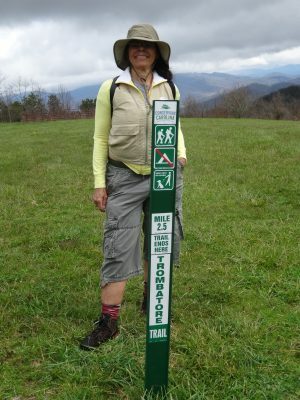 The hikers included her friend, Flo Mayberry, a fellow retiree and former Californian; her boyfriend Larry Pender; and Tony Beurskens, the community engagement manager for Conserving Carolina. It was their first hike, on the six-mile Wildcat Rock Trail, near Gerton, NC. The hikers were at different levels of comfort. Some walked confidently over a log to cross a creek. Tanya crawled across. Some were tall with long strides, but Tanya’s not even five feet tall. She had to work harder to keep up. Then they got to the cliff—that narrow trail over bare rock. “I overcame my fears and I did it,” Tanya says. “And it was so beautiful. Oh, it was so pretty up there.” The rock outcrop offered views over a valley with farmland curling into forests, and across to more mountains. Where Are the Black and Brown Faces? Her adventure started with a lecture—when Frank and Audrey Peterman came to Western North Carolina in March. Multiple conservation groups sponsored their visit, which included a tour of the Carl Sandburg House in Flat Rock and the keynote address at UNC-Asheville’s Greenfest. In her Jamaican accent, Audrey told her story. She was already in her 40s by the time she discovered the national parks in her adopted country. The first one she visited was Acadia, in Maine. On a mountain overlooking the sea, she realized that if God had created a place so perfect, so beautiful, so wondrous, and God had also created her, then she must also be perfect, beautiful, and wondrous. And so must everyone else. She’s tried to live in the light of that insight ever since, she said. She and Frank set out to see more of these awe-inspiring places, on a 12,000 mile road trip as their last child was graduating from college. But they wondered why they saw so few people who looked like them. Where were the people with black or brown faces? In Yellowstone, Frank met an older white man who told them what he’d seen when he came as a boy with his father, and later when he brought his son. “That was one of the few times in my life that I questioned whether I had been a good father,” Frank said at UNC-Asheville. This man had passed on to his family a sense of ownership of the national park. Frank had not done that for his children. Audrey and Frank set out to change what they saw, launching new careers as advocates for engaging Americans, in all of their diversity, with the nation’s public lands. Kathey Avery’s family has lived in Bat Cave for generations. Her grandmother and great grandmother sold timber off their land. Her parents farmed and grew apples. In this tight-knit community, her father was a founding member of the volunteer fire department. But she knows that, to other African-Americans, places like Bat Cave are foreign. 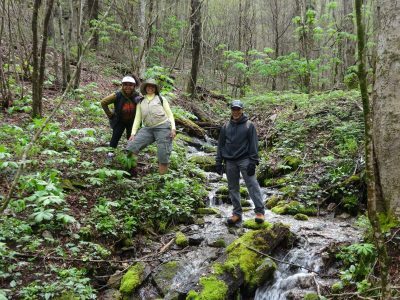 When African-Americans don’t leave the city, she says, they miss out on the beauty, the fresh air, the exercise, and the peace of mind they could find in the mountains. 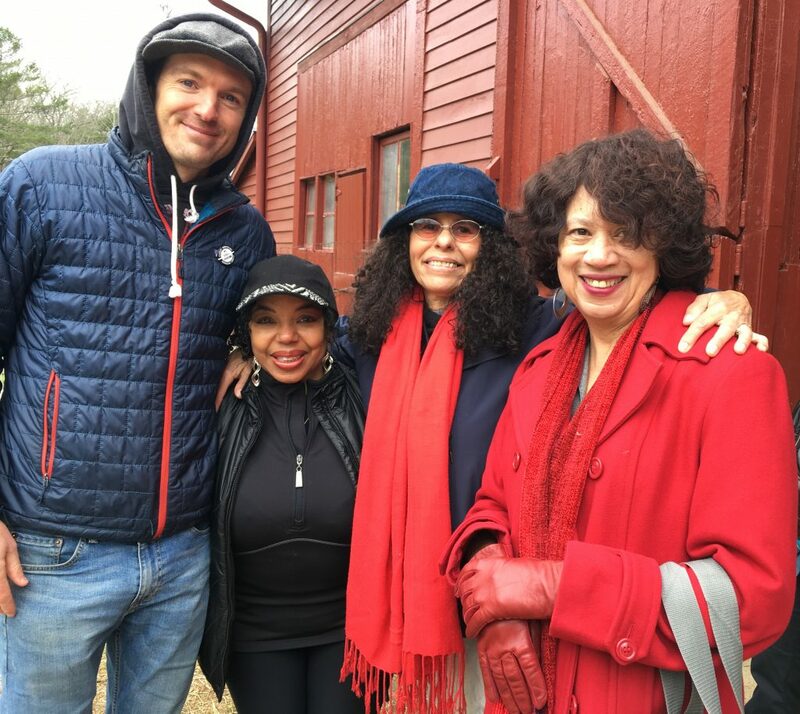 When Kathey heard about the event with the Petermans, she told her neighbor Flo, who passed on the word to Tanya. At a reception after the talk, they were sitting at a table with Tony from Conserving Carolina and George Ivey from the North Carolina Arboretum. They decided, on the spot, to do something. Flo is a third-generation San Franciscan, who moved to Bat Cave with her husband eight years ago. But, after the Petermans’ talk, she realized that she doesn’t know that many local trails. If they started a hiking group, where would they go? 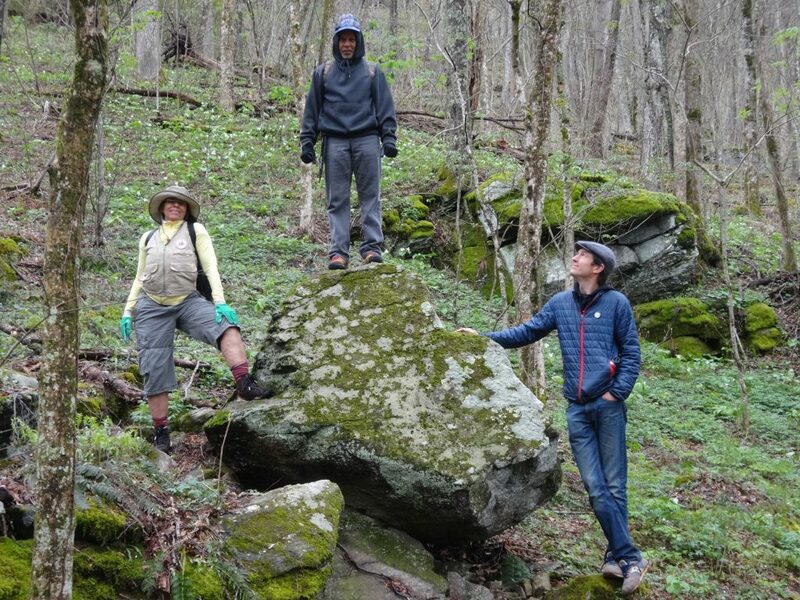 Tony introduced them to the Wildcat Rock Trail and, next, the Trombatore Trail. 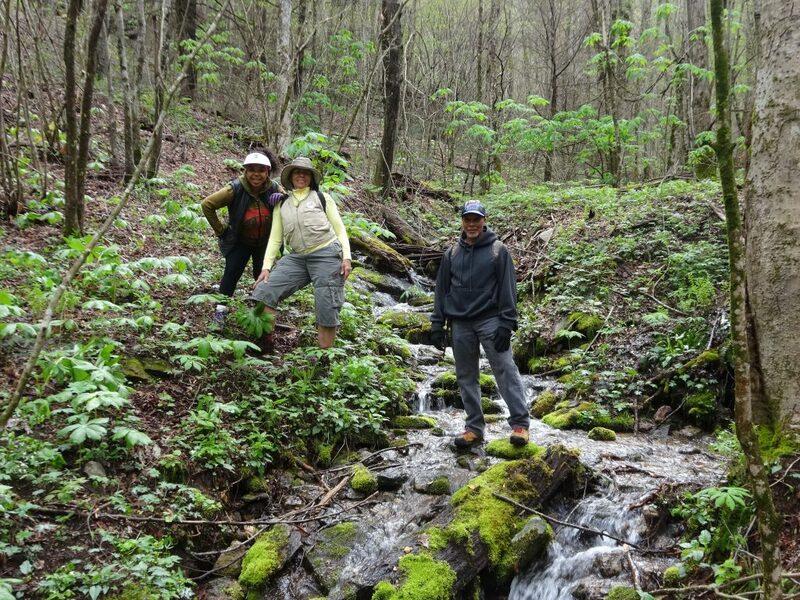 Both trails cross land that is owned by Conserving Carolina in the Hickory Nut Gorge. She and her friends have stayed in close touch with Frank and Audrey and they’re excited to visit them in Florida this fall and see the Everglades. As they get their group off the ground, they have a lot of ideas. They want to connect with new people. They want to engage younger people. They want to offer more kinds of activities, like picnics, strolls, or bike rides. They talk about traveling to see national parks. They talk about expanding to multiple chapters. This article was originally published in the Hendersonville Times-News.